The understanding of the origin and progression of cancer remains in its infancy. However, due to rapid advances in the ability to accurately read and identify (i.e. sequence) the DNA of cancerous cells, the knowledge in this field is growing rapidly. Several comprehensive sequencing studies have shown that alterations of single base pairs within the DNA, known as Single Nucleotide Variants (SNVs), or duplications, deletions and rearrangements of larger segments of the genome, known as Structural Variations (SVs), are the primary causes of cancer and can influence what drugs will be effective against an individual tumor. However, one of the major roadblocks hampering progress is the availability of accurate methods for interpreting genome sequence data. Due to the sheer volume of genomics data (the entire genome of just one person produces more than 100 gigabytes of raw data! ), the ability to precisely localize a genomic alteration (SNV or SV) and resolve its association with cancer remains a considerable research challenge. Furthermore, preliminary benchmark studies conducted by the International Cancer Genome Consortium (ICGC) and The Cancer Genome Atlas (TCGA) have discovered that different mutation calling software run on the same data can result in detection of different sets of mutations. Clearly, optimization and standardization of mutation detection methods is a prerequisite for realizing personalized medicine applications based on a patient’s own genome. The ICGC and TCGA are working to address this issue through an open community-based collaborative competition, run in conjunction with leading research institutions: the Ontario Institute for Cancer Research, University of California Santa Cruz, Sage Bionetworks, IBM-DREAM, and Oregon Health and Sciences University. Together, they are running the DREAM Somatic Mutation Calling Challenge, in which researchers from across the world “compete” to find the most accurate SNV and SV detection algorithms. By creating a living benchmark for mutation detection, the DREAM Challenge aims to improve standard methods for identifying cancer-associated mutations and rearrangements in tumor and normal samples from whole-genome sequencing data. Given Google’s recent partnership with the Global Alliance for Genomics and Health, we are excited to provide cloud computing resources on Google Cloud Platform for competitors in the DREAM Challenge, enabling scientists who do not have ready access to large local computer clusters to participate with open access to contest data as well as credits that can be used for Google Compute Engine virtual machines. By leveraging the power of cloud technologies for genomics computing, contestants have access to powerful computational resources and a platform that allows the sharing of data. We hope to democratize research, foster the open access of data, and spur collaboration. In addition to the core Google Cloud Platform infrastructure, the Google Genomics team has implemented a simple web-based API to store, process, explore, and share genomic data at scale. We have made the Challenge datasets available through the Google Genomics API. The challenge includes both simulated tumor data for which the correct answers are known and real tumor data for which the correct answers are not known. 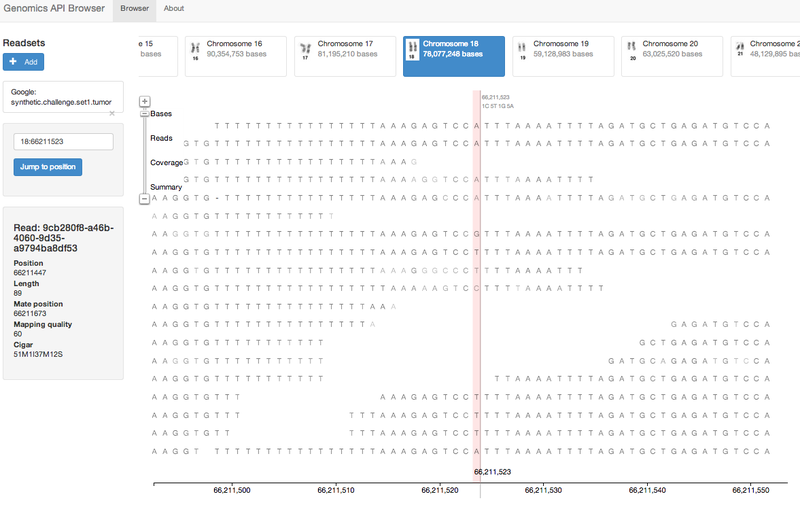 Genomics API Browser showing a particular cancer variant position (highlighted) in dataset in silico #1 that was missed by many challenge participants. Although submissions for the simulated data can be scored immediately, the winners on the real tumor data will not immediately be known when the challenge closes. This is a consequence of the fact that current DNA sequencing technology does not provide 100% accurate data, which adds to the complexity of the problem these algorithms are attempting to tackle. Therefore, to identify the winners, researchers must turn to alternative laboratory technologies to verify if a particular mutation that was found in sequencing data is actually (or likely) to be true. As such, additional data will be collected after the Challenge is complete in order to determine the winner. The organizers will re-sequence DNA from the cells of the real tumor using an independent sequencing technology (Ion Torrent), specifically examining regions overlapping the positions of the cancer mutations submitted by the contest participants. As an analogy, a "scratched magnifying glass" is used to examine the genome the first time around. The second time around, a "stronger magnifying glass with scratches in different places" is used to look at the specific locations in the genome reported by the challenge participants. By combining the data collected by those two different "magnifying glasses", and then comparing that against the cancer mutations submitted by the contest participants, the winner will then be determined. We believe we are at the beginning of a transformation in medicine and basic research, driven by advances in genome sequencing and computing at scale. With the DREAM Challenge, we are all excited to be part of bringing researchers around the world to focus on this particular cancer research problem. To learn more about how to participate in the challenge register here. Twice a year, Google’s Faculty Research Awards program seeks and reviews proposals in 23 research areas, assigning to each area a group of experienced Googlers who assess and deliberate over which proposals we should and can fund. With each call for proposals, we receive a wide array of research ideas in fields that fall within the realm of Internet policy. Accessibility: Google is committed to supporting research that generates insights about what helps make technology a usable reality for everyone, regardless of cognitive, physical, sensory, or other form of impairment. Access: What policies help bring open, robust, competitive and affordable Internet access to everyone in the world? What are the economic and social impacts of improved Internet access? In particular, what are the emerging impacts of gigabit access networks? Intellectual property (IP) in the digital era: The growth of digital industries has meant that IP law is an increasingly important policy tool governing innovation and economic growth. We would like to better understand how IP legislation can enable new technologies, and what effect different national or regional IP regimes have on innovation, such as the effect of patent litigation on invention, and how copyright exceptions affect the creation of online technologies. Freedom of Expression: As an advocate of freedom of expression on the Internet, Google is interested in research that produces insights into how discourse and expression in the global online (public) sphere happens, and how stakeholders best allow freedom of expression, balance it with other rights and resolve conflicts or interest/disputes. Internet Governance: The Internet is a universal space that many expect to remain open, free, and borderless. Multiple stakeholders (internet companies, governments and civil society) work together to design the governance practices and institutions to maintain order and innovation in the global Internet ecosystem. We are interested in supporting top researchers who analyze and contribute insights into which practices and institutional structures work and which don’t. Open Standards and Interoperability: Open Standards and interoperability of services are at the core of the Internet’s successful international propagation and usefulness. Google is interested in research that contributes analysis and best practices for standardization and interoperability. Among them we see resource management, access control and authorities for the Internet of Things, as well as questions regarding convergence and security. Also, cloud computing and storage could benefit from open standards that enable interoperability. Additionally, there are several important research areas like Privacy, Economics and market algorithms, and Security, which have a significant policy component but are dealt with as research topics distinct from policy & standards. Researchers who are interested in applying for a Faculty Research Award can do so twice a year following the instructions laid out on the Google Faculty Research Awards website. Additional information about Internet Policy research support from Google, including the Google Policy Fellowship program, can be found in the recent post on the Google Europe Blog. We look forward to your proposals. Think shrink! Min it to win it! Smaller is baller! That's what the Little Box Challenge is all about: developing a high power density inverter. It’s a competition presented by Google and the Institute of Electrical and Electronics Engineers Power Electronics Society (IEEE PELS) -- not only a grand engineering challenge, but your chance to make a big impact on the future of renewables and electricity. With the rise of solar photovoltaic panels, electric vehicles (EV) and large format batteries, we’ve seen a resurgence in the over-a-century-long feud between Thomas Edison’s direct current (DC) and Nikola Tesla’s alternating current (AC). The electric grid and most higher power household and commercial devices use AC; batteries, photovoltaics, and electric vehicles work in DC. So the power electronics that convert between the two -- rectifiers (AC->DC), and inverters (DC->AC) -- are also gaining increased prominence, as well as the DC/DC and AC/AC converters that switch between different voltages or frequencies. While different flavors of these devices have been around for well over a century, some of them are starting to show their age and limitations versus newer technologies. For example, conventional string inverters have power densities around 0.5-3 Watts/Inch3, and microinverters around 5 Watts/Inch3 -- but lithium ion batteries can now get 4-10 Watt Hours/Inch3. So for a 1-2 hour battery pack, your inverter could end up being bigger than your battery -- a lot to carry around. Some recent advances may change what’s possible in power electronics. For example, Wide-bandgap (WBG) semiconductors -- such as gallium-nitride (GaN) and silicon-carbide (SiC) -- not only enable higher power densities than conventional silicon-based devices do, but can also convert between DC and AC at higher temperatures, using higher switching frequencies, and with greater efficiency. But even WBG materials and other new technologies for power electronics run into limits on the power density of inverters. Photovoltaic power and batteries suffer when they see oscillations on their power output and thus require some form of energy storage -- electrolytic capacitors store that energy and bridge the power differential between the DC input and the AC output, but that makes the devices much larger. Household and consumer devices also need to add filters to prevent electromagnetic interference, so that’s even more bulk. When it comes to shrinking these devices, inverters may have the most potential. And because inverters are so common in household applications, we hope The Little Box Challenge may lead to improvements not only in power density, but also in reliability, efficiency, safety, and cost. Furthermore, it is our hope that some of these advances can also improve the other types of power electronics listed above. If these devices can be made very small, reliable and inexpensive, we could see all kinds of useful applications to the electric grid, consumer devices and beyond, maybe including some we have yet to imagine. Research at Google will provide unrestricted gifts to to academics pursuing the prize. This funding can be used for research equipment and to support students. Visit the Little Box Challenge awards for academics page for more info -- proposals are due September 30, 2014. Academics often have trouble getting the latest technology from device manufacturers to tinker on. So Google has reached out to a number of WBG manufacturers who’ve put up dedicated pages detailing their devices. Check out the Little Box Challenge site to get started. We hope you’ll consider entering, and please tell your colleagues, professors, students and dreamers -- you can print and post these posters on your campus to spread the word. Imagine yourself filling out a long and cumbersome form on a website to register for a service. 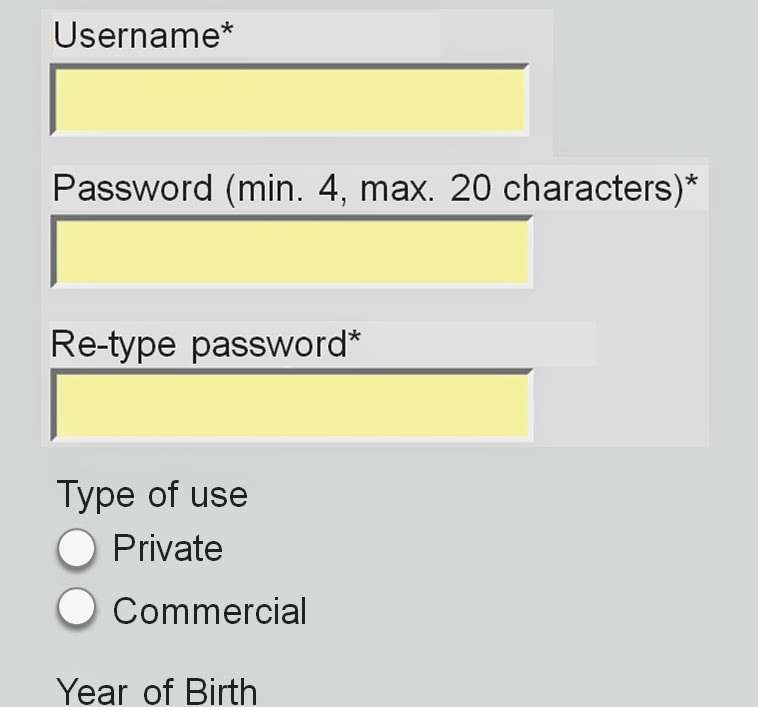 After several minutes of filling out fields, coming up with a password, and handling captchas, you click the submit button to encounter your form filled with red error messages. Suddenly the “close tab” button seems much more tempting than before. Despite the rapid evolution of the Internet, web forms, with their limited and unilateral way of interaction, remain one of the core barriers between users and website owners. Any kind of obstacle or difficulty in filling in online forms can lead to increased frustration by the user, resulting in drop-outs and information loss. In 2010, a set of 20 guidelines to optimize web forms was published by researchers from the University of Basel in Switzerland, including best practices aimed to improve web forms and reduce frustration, errors and drop-outs. For instance, guideline no. 13 states that if answers are required in a specific format, the imposed rule should communicated in advance; or no. 15 that states that forms should never clear already completed fields after an error occurs. To investigate the impact of applying these rules, we conducted a study and presented our results at CHI 2014: Designing usable web forms: empirical evaluation of web form improvement guidelines. In the study, we examined a sample of high traffic online forms and rated them based on how well they followed the form guidelines outlined by the 2010 publication. We then selected three different online forms of varying qualities (low, medium and high), and improved them by applying the guidelines, with the high quality form needing less modification than the medium and low quality forms. We then tested both the original and improved forms extensively with 65 participants in a controlled lab environment. In our study, the modified forms showed significant improvements over the original forms in the time users needed to complete a form, an increase in successful first-trial submissions and higher user satisfaction. As expected, the impact was highest when the original form was of low quality, but even high quality forms showed improved metrics. Format specifications (e.g., requiring a minimum password length) should be stated in the form, prior to submission. The application of this guideline had a large positive impact on user performance, subjective user ratings and was also mentioned frequently in user interviews. Error messages must be placed next to the erroneous field and designed in a way users are easily able to fix the problem. Doing this reduced form-filling time and increased subjective ratings. Most frequently users mentioned that it was key to be able to tell apart optional and mandatory fields. Putting field labels above rather than adjacent to the fields in the form led also to improvements in the way users scanned the form. Using eye-tracking technology, our study shows that users needed less number of fixations, less fixation time and fewer saccades before submitting the form for the first time. From our study, we conclude that optimizing online forms is well worth the resource investment. With easy to implement actions, you can improve your forms, increase the number of successful transactions, and end up with more satisfied users. Google is currently working on implementing these findings on our own forms. We wish to thank our co-authors at the University of Basel, Switzerland for their collaboration in this work: Silvia Heinz, Klaus Opwis and Alexandre Tuch.